A unique new pharmacy developed to explore more effective models of medication management and pharmacist-based patient care, improving drug safety and efficacy by reducing medication errors and lapses, officially opened with a ribbon cutting on the Parnassus campus on Tuesday. 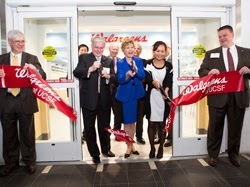 “Walgreens at UCSF,” located across the street from UCSF Medical Center, is a joint effort between the nation’s largest drug store chain, the UCSF School of Pharmacy, and the Medical Center. Designed to foster increased patient-pharmacist interaction, the store includes multiple areas for private consultations. 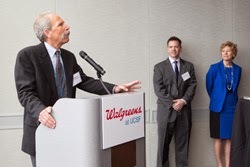 Pharmacists from both UCSF and Walgreens will jointly staff the pharmacy. It will also serve as a training facility for UCSF student pharmacists during the experiential portion of their doctoral degree program and as a clinical training site for pharmacy residents. “This collaboration aims to transform the practice of community pharmacists to enable pharmacists to do what they’re trained to do, which is helping patients manage their health with the right medications and understand how to take them correctly,” said School of Pharmacy Dean B. Joseph Guglielmo, PharmD. Desmond-Hellmann, MD, MPH, chancellor, UCSF. Among the new pharmacy’s goals will be to ensure that there is a proper hand-off and coordination of medication information when patients are discharged from the hospital, preventing lapses or misuse that can cause medically and economically costly readmissions. “By creating this three-way collaboration, we hope to create a national model for eliminating medication-related readmissions and reducing medication errors,” said Daniel Wandres, PharmD, chief pharmacy officer of the UCSF Medical Center. Myra Pascua, Walgreens; Joel Wright, Walgreens. The pharmacy will also routinely provide customers receiving prescriptions with comprehensive medication counseling. This will include the creation and review of complete, accurate, and portable medication lists, to help decrease drug-drug interactions and encourage patient adherence with their regimens. This health care service was demonstrated during Tuesday’s opening with a “MedList” clinic provided free to the public by UCSF pharmacists at the nearby Millberry Union Gym.